Anyone who has worn a kilt for any length of time that wears a kilt pin knows the feeling. Whether its watching a small hole start where the pin goes through the fabric or fraying at the point, it's painful to see. I have found a way that seems to help however, it also helps to prevent holes, fraying, tears caused by kilt pins. It also prevents you from losing the pin if it comes unclasped. Note this does present its own problems, but I feel the benefits far out weight the risk. To do this, you simply add a tiny piece of elastic band as shown in the picture below. @Madadh Also had a similar, good idea. I find a small piece of leather also does the trick, especially for the large safety pins. @The Wizard of BC had the following sage advice on this issue. 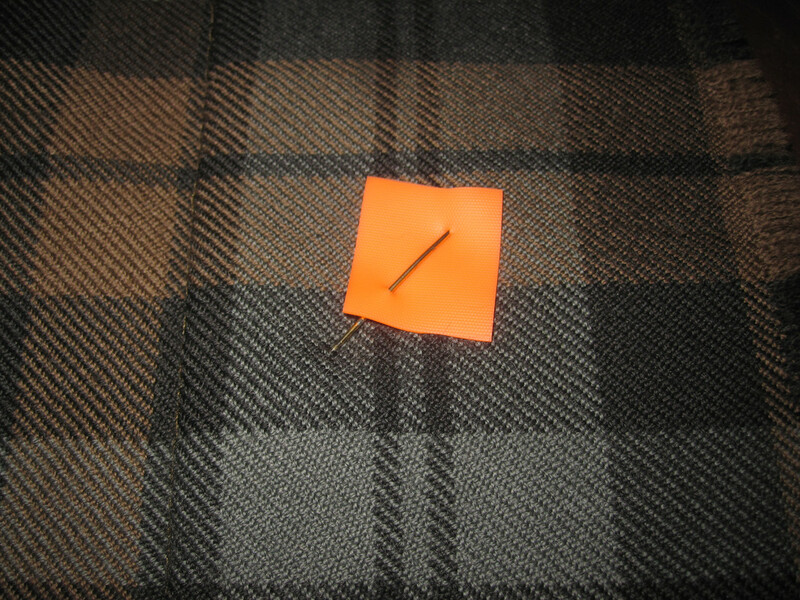 I have begun to make all my kilts with extra, 4 inch, wide apron facings to serve as re-inforcment behind the kilt pin. I then use a piece of wide rubber band, or in this case a piece cut from the disposable tourniquet from a blood lab, to keep the pin in place just in case it comes open. In the old days, the military would use a piece of canvas, or anything close at hand, as a kilt pin backing. Just give up the kilt pin - it's totally unnecessary. I never wear one. I would but for the fact the wind from riding my bicycle requires it to prevent everything from flying around. I have begun to make all my kilts with extra, 4 inch, wide apron facings to serve as re-reinforcement behind the kilt pin. I really like this idea. What are your thoughts on reinforcing the proper section of the front apron using the felting repair technique you have described elsewhere to help prevent issue in lieu of this if I may ask? I've never found it a problem cycling in a kilt which most of us did to and from school in younger days. Really? That's very interesting, I would have thought that to be a bit issue. I must mention I also move my sporran to my left side, as it can wrinkle the apron if you ride everyday from my experience. The pin helps to make up for that a bit. I may have to give this a try, knowing how windy it gets across the pond. To be honest I like the look of the kilt pin as well. Thanks for the info! I don't understand how a kilt pin would help. It is only supposed to be through the top apron. Can you enlighten me how it would help?